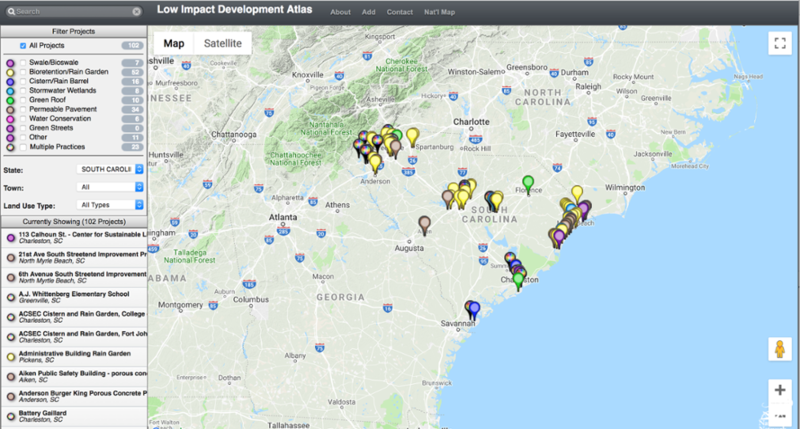 This atlas is made possible by the National NEMO Network (Nonpoint Education for Municipal Officials), SC NEMO, SC Sea Grant, Carolina Clear and Clemson University’s Center for Watershed Excellence. Appreciation is hereby expressed to the ACE Basin and North Inlet-Winyah Bay National Estuarine Research Reserves for their feedback and assistance in the development of this atlas for South Carolina. The goal of the atlas below is to share information among communities and organizations so that low impact development projects can serve as models for communities trying to address stormwater and growth-related issues. Please click on the map below to open a new window to the actual 'live' S.C. LID Map tool. Want to enter your own LID project? To enter your data, which will be uploaded to the live atlas tool, please select the link below to open the data entry form. Please note that your entry will not be immediately uploaded onto the map due to our quality control process which will ensure consistent data entry. You will need to know some information about the project, and you will also be given the opportunity to link the project to photos and a project website. Click HERE to open the data entry form and begin entering your data! To view how-to and introductory videos about LID installations in South Carolina, please see our YouTube Channel! www.youtube.com/carolinaclear.